Protesting climate change and treating it like it’s an emergency isn’t just for children. Today, thousands of protesters around the world took to the streets as part of a wave of coordinated action led by climate activism organisation Extinction Rebellion. The most visible protests took place in London, shutting down traffic around the city. That disruption took the form of blockades around London on Monday morning. Thousands poured into the streets at locations including Marble Arch, Parliament Square, Waterloo Bridge, and Piccadilly and Oxford Circuses. At the latter, protesters unveiled a sailboat named after Berta Cáceres, a Honduran environmental activist who was murdered in 2016. 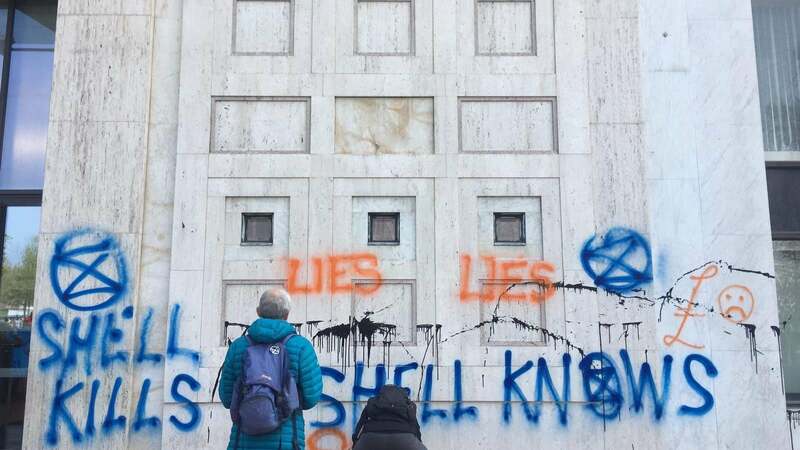 At Shell’s London office, protesters superglued themselves to the front door and splashed the facade with paint, tags, and stickers calling out the company for “ecocide” and highlighting its history of climate obfuscation. Ahead of the actions, Extinction Rebellion said that they would be part of a “non-violent, peaceful act of rebellion,” and as of this afternoon, it appeared to have remained that way. “This is not a political movement, this is humanity, what it means to be human,” Jamie Kelsey Fry, a speaker at the Parliament Hill gathering, told an estimated crowd of 2,000. Other protests took place around Europe, including in Norway, Denmark, and Sweden. The week of action includes events planned in more than 33 countries, according to Extinction Rebellion. Despite the frustration many protesters share over government’s unfulfilled pledges for climate action as emissions keep rising, the mood wasn’t necessarily dour. Protesters were there to celebrate life on Earth. DJs, bands, impromptu dance parties, and even a skate ramp were all part of the encampments that sprung up across London. Extinction Rebellion activists have been staging increasingly visible protests, including recently getting naked in the gallery during a session of the House of Commons. And they’re hardly alone as a growing segment of civil society is agitating for climate action all around the world. The youth school strike movement sparked by Greta Thunberg, a Swedish teenager, turned out 1.5 million students last month. And in America, groups like the youth-led Sunrise Movement have pushed for change by backing the Green New Deal, staging protests in Congressional offices, and setting up town halls to discuss climate policies. Some politicians from the Labour Party to US Representative Alexandria Ocasio-Cortez are also approaching climate change with an urgency in line with what these groups are demanding. And those demands are well-grounded in science.